A Passivhaus is characterised by having a very high degree of thermal comfort whilst maintaining very low energy consumption. The houses are ‘passive’ because the majority of the heat demand is met from ‘passive’ sources, such as: solar radiation (the sun shining through the window); body warmth from inhabitants; cooking heat; and heat from domestic appliances (televisions, laptops etc). Through super insulation, high quality windows, draft proof construction and heat recovered ventilation, this passive heating is sufficient to keep the house warm. The result is high quality internal environment that requires very little energy). As such Passivhaus construction is an important innovation in reducing climate change emissions. Passivhaus design principles are not limited to just houses residential buildings. Externally Passivhaus buildings do not differ from conventional construction. 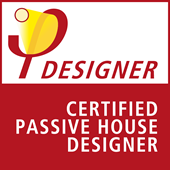 The Passivhaus standard refers maximum energy requirements rather than prescribing any particular design or construction type. Passivhaus buildings are so well designed and constructed that the small ‘active’ heat demand that the building might require can be provided via a small heater battery in the ventilation system. More simply described, the heating demand is so low that a room of 20 m² can be heated by just the body warmth of four people or ten tea lights - even in the coldest winter! What are the advantages with Passivhaus buildings? Key to Passivhaus design is the controlled ventilation with heat recovery. The ventilation system supplies fresh air (pollen and dust filtered) to the house whilst retaining the heat from the exhausted stale air. Without this heat recovery the heat lost through the windows would be the biggest heating demand of the whole house. Old buildings loose large amount of heat through cracks in the construction and cause uncomfortable drafts. Air tight and draft proof construction keeps the house comfortable, and the heat inside. 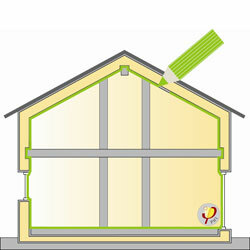 Furthermore the ventilation controls the moisture content in the house preventing condensation and mould growth. Passivhaus energy saving are typically 90% lower in comparison to existing housing stock. 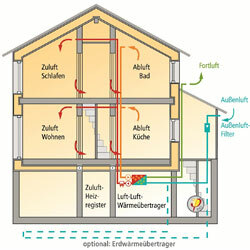 A Passivhaus has an annual heating demand of under 15kWh per square meter. This is the equivalent to requiring less than 1.5 litres of heating oil - current UK building regulations is over 8 litres. The implementation of the Passivhaus standard contributes significantly to the reduction of climate change emissions by reducing the need for fossil fuels to be burnt for heating homes. 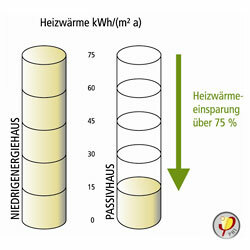 The small remaining energy demand of a Passivhaus can be easily met through renewable sources and on-site generation. An increasing number of lenders are offering low interest mortgages to low energy house builders. The well recognised and highly regarding Passivhaus standard is an optimal way of securing such financial benefits. How does Passivhaus achieve such low-energy performance? 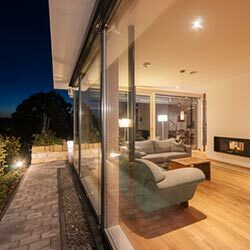 The exceptional thermal insulation of a Passivhaus, significantly reduces heat losses and leads to higher temperatures of the interior surfaces in the winter, and lower temperatures in the summer. The internal surface temperatures hardly differ from the ambient air temperature. This creates a pleasant indoor climate and prevents condensation and mould growth on cold surfaces. Two - Triple glazed insulated windows and frames. Glazing represents is the clearest relation between building and environment; letting light and views in. Additionally they provide important heat gains as solar energy enters the building through the windows. In a Passivhaus the windows are airtight, triple glazed and have an insulated frame. This means, even in the winter, the windows admits more solar warmth than that lost through the glazing and frame. Much heat is lost in buildings where buildings elements (walls, roofs, windows etc) meet and the insulation values are lower. This is called a ‘thermal bridge’ as it allows the heat to escape from the house to the outside. Through robust and well-detailed construction thermal bridging is all but removed in a Passivhaus. An air tight building has multiple advantages: comfortable and draft free; prevents structural damage; improved sound insulation and reduced heat losses. Heat recovery from the warm, but stale, exhaust air from the house is essential for a Passivhaus. The heat recovery unit, which is part of the ventilation system, can recover up to 90% of heat from exhaust air whilst ensuring a fresh healthy supply of air to the building. Without the comfort ventilation and heat recovery a significant amount of heat would be lost when warm escapes from the window and replaced with cold air. Windows of course can be opened when required.